Consumption of Longing shows a woman being groped over by three men at a social engagement. The men are pressed into this woman’s personal space, each in competition for recognition. All the subjects in this piece are drinking alcohol and do not wear any engagement rings or wedding bands. 37" x 4" x 93.5"
Male Gaze documents the pressures on women to look a certain way in our society, while simultaneously protecting themselves from strangers. 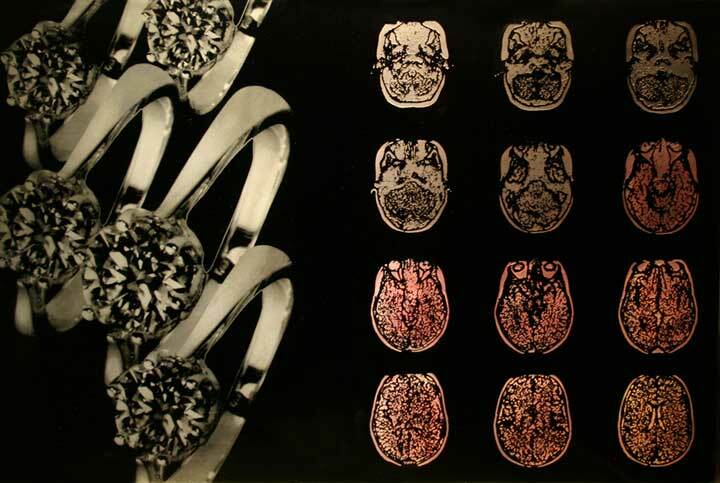 The left side of this work is mix of hand collage work composted into several photographic captures, that is printed onto one large duratran, (a back lit piece of digital film). These many layers of imagery are composed on top of one another. 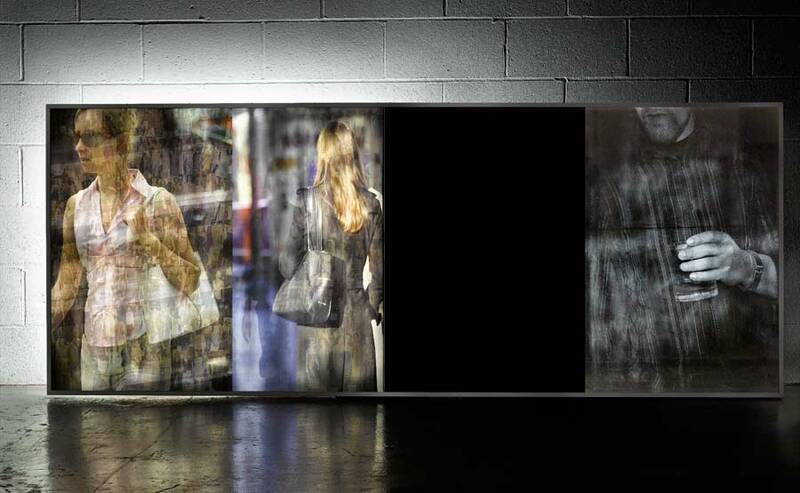 Several images of women walking in the streets, layered on top of an image of the hair dye shelf in the supermarket, on top of the a hand collage of hundreds of clippings from fashion magazines of runway models layered in different opacities to create a photographic captures that summarizes the motion, speed and attraction of women in the motion of the city. On the right side of this piece is a sandblasted halftone image of a man holding a scotch glass. He is represented alone in black and white, separated by distance and the lack of color from the women. He is looking towards the women to the left in a consuming gaze. Saturation revels photographs of women that the artist has taken off several different dating websites. Starosielski has tiled all the smiling happy women as one background layer to this work. 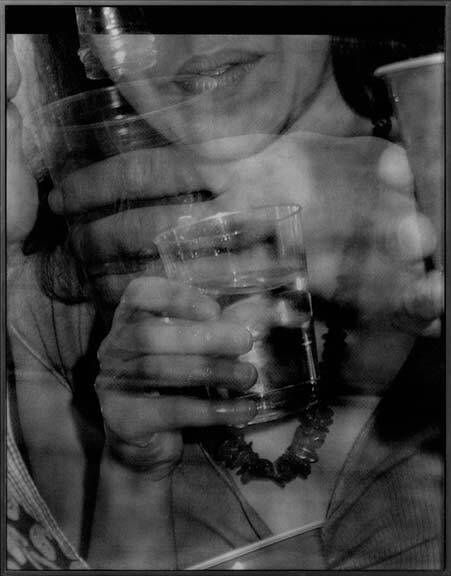 In another layer, Starosielski photographed women (holding wine glasses who are drinking alcohol and do not wear any engagement rings or wedding bands) during several social galas, benefits and networking events throughout the city. These photographs are cropped in long thin slices reveling to the body. The right end of this work, the artist tiles magazine tears of wedding and diamond ring advertisements showing happy couples in love. Starosielski is creating a dialectic from way things really appear to be, the way society presents once self to mimic the advertisements for products that aid in love and happiness. 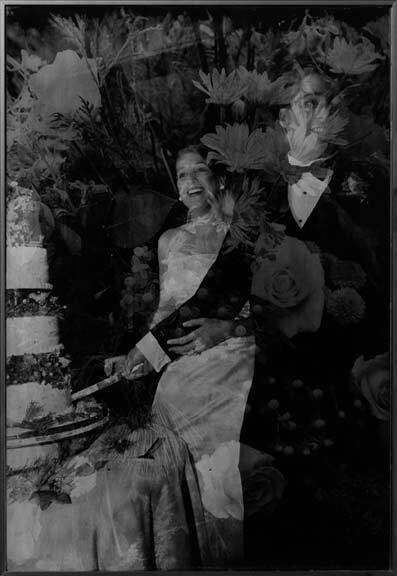 Flowering Bliss, the last piece in this series documents the utter love and complete bliss of a couples’ wedding day as they cut their towering cake in front of all their friends and family. This is the only piece in this series where a woman is wearing diamond engagement and wedding rings. Layers of flowers are composed over the entire composition, as the couple slices though their cake in utter bliss for one another. The photographic imagery in this work is a very complex, lengthy and expensive process. The images are created from original digital photography and collage imagery from the media. Multiple captures are layered onto one another. I, then, produce a halftone image and have a film printed out at scale. The film is layered below a resist material and exposed by an ultraviolet light on a vacuum table. After the resist is washed out, I sandblast the imagery onto a quarter-inch, thick glass sheet. This creates a permanent halftone image on the front plane of glass, which is framed in front of a black or gray mirror, thus creating a three-dimensional quality image when front lit. The image rendered is a permanent capture of sequenced events.